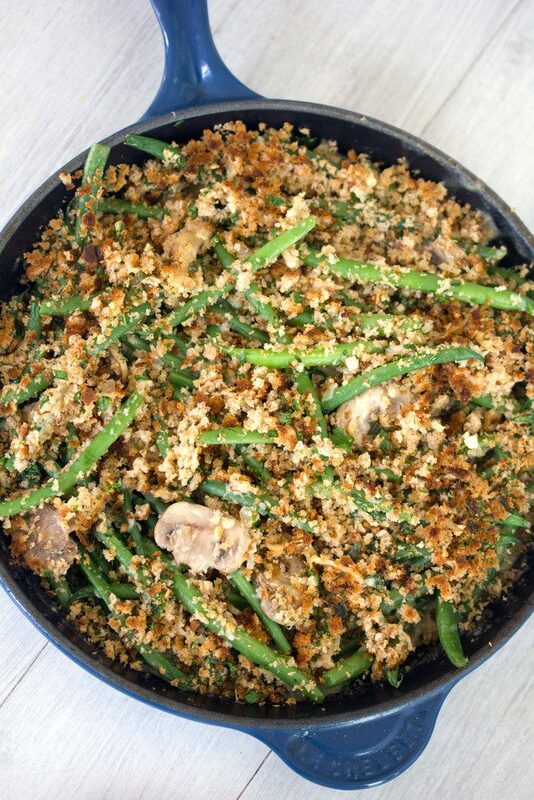 Instead of using canned ingredients, try this healthier skillet green bean casserole with fresh green beans and onions, a homemade cream of mushroom sauce, and a crunchy breadcrumb topping. I’m going to be so cliché and say that I cannot even believe that Thanksgiving is next week. But then I’m going to take it a step further and say that it is like really, really freaking me out. A few years ago, I read an article about how the older we get, the faster time goes. We kind of already knew that, right? But the really scary part? Allegedly, by the time you’re seven, half of your “perceived life” is over. And considering I’m much, much older than seven, I feel like I’ve basically got one foot in the grave over here. And I can’t even imagine how quickly the seasons will go by in just a few years from now. Or how much shorter my days will get. Will I wake up, get dressed, and then immediately have to go back to bed? Hellooo, don’t the heavens above understand that the older I get, the more time I need? Stop taking it away from me! All of that to say, I didn’t get the chance to make a fraction of the Thanksgiving dishes I wanted to make this year. And at the rate time is moving, I may as well just get started on making Thanksgiving dishes for next year. That’s really only a half joke. However, I did have time to whip up the glorious-looking revamped green bean casserole I spotted in this year’s Thanksgiving issue from Cooking Light. And if I could only make one new dish this year, I’m glad this was it. See… I don’t think I’ve ever had a traditional green bean casserole. At the risk of sounding food snobby, I just can’t get behind canned onions and cream of mushroom soup mixing with fresh and crispy green beans. Solution? Make your own cream of mushroom sauce, sauté some fresh onions, and toast up a crunchy breadcrumb topping. I promise it’s not that much more time-intensive than opening cans. And so, so worth it. I mean, when you’re eating green bean casserole, don’t you actually want to taste the green beans? And how fresh and delicious they are? And don’t you want to still get a little bit of a crunch instead of just a soggy mess? I thought so. Also, look at that topping mixture. My idea of heaven. The green beans are boiled for a few minutes and then the “casserole” is broiled in a skillet for just a couple minutes, so the beens retain their beautiful color and crunch. A fact for which I am completely thankful. Also, they don’t need to be in the oven for long, so it’s easy to broil these after your turkey is out and resting. Though if you want to be really specific, this isn’t actually a green bean casserole. It’s a haricot vert casserole. But you can totally use regular green beans with no problem; you might just want to boil them for a little while longer. Unless you’re like me and you love a super al dente green bean! To be clear, I totally understand if you would prefer to serve the traditional green bean casserole at your dinner. I am all about Thanksgiving traditions and it’s pretty rare for us to introduce a new dish to our dinner table on the big day. 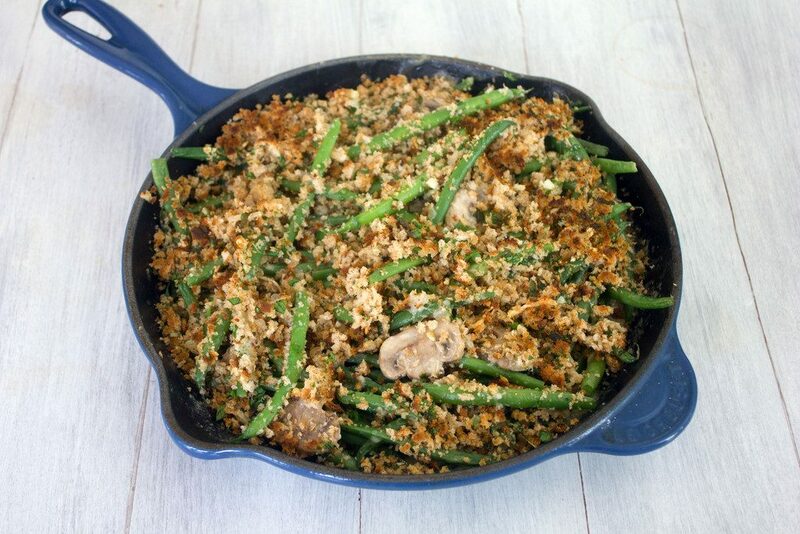 I use this time of year to discover new dishes that I can enjoy around the holiday and this skillet green bean casserole is a recipe I’d make for any dinner during the cold weather months. Oh wait, I haven’t even mentioned that it’s healthier than your average green bean casserole! Way healthier. And I think way tastier, too. And because this recipe makes a fairly decent amount of green beans (especially if you’re not serving it for a crowd and just have one other person in your household), you’ll have leftovers for day. While you may not think green bean casserole is a very appropriate breakfast food, I’m here to tell you it is. Especially when you put a poached egg (or sunny-side up) egg on top. That’s enough to make me want to cancel all my Thanksgiving plans and just make a skillet green bean casserole for myself to enjoy for a couple days. OK, I wouldn’t actually do that. But I will most certainly be making this again before the season is over. And probably putting 6 poached eggs on top and eating it right out of the skillet. Possibly while wearing my pajamas. And alternating it with bites of leftover stuffing. And really bad Christmas movies. Time really needs to slow down so I can spend more of it enjoying dishes like this one. And stop being sad that I didn’t discover this in the first seven years of my life. Boo. Are you a Thanksgiving traditionalist or do you serve new dishes at your table each year? If you’re looking for more delicious holiday side dishes, check out my Mojito Cranberry Sauce or my loaded mashed potatoes in jars. Bring a large saucepan filled with water to a boil. Cook beans for about 3 minutes (a minute or two longer if not using haricot verts) or until crisp-tender. Plunge beans into ice water to stop cooking and drain well. Put bread in food processor and pulse until coarse crumbs form. 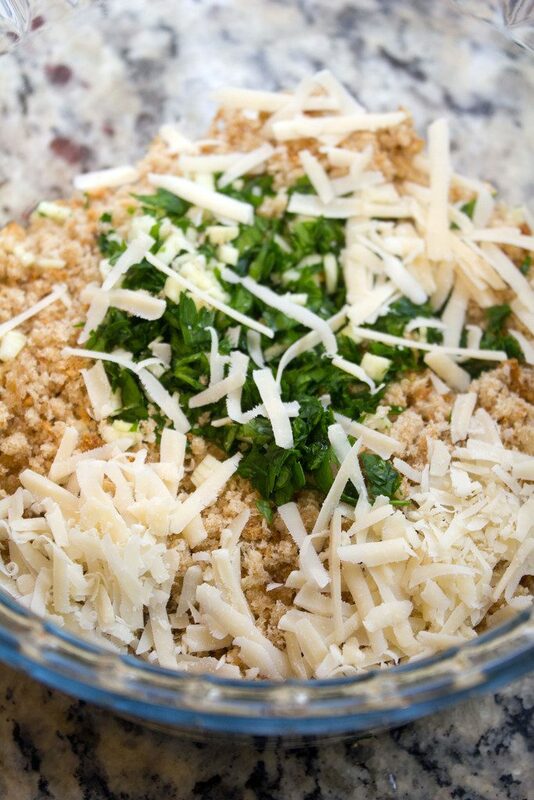 Remove to a bowl and mix in parsley, 1 Tbsp olive oil, minced garlic, and 2 Tbsp grated parmesan cheese. Heat remaining 2 Tbsp olive oil in a 10-inch cast-iron skillet over medium heat. Add onion and mushrooms and sauté for about 8 minutes. Stir in flour and cook for 1 minute. Stir stock, milk, and sherry into the skillet and bring to a simmer. Cook for about 3 minutes. Remove skillet from heat and stir in remaining 4 Tbsp parmesan, salt, pepper, and nutmeg. Add beans to pan and toss to coat in mushroom/onion mixture. Sprinkle skillet with breadcrumb mixture and place under broiler for 2 minutes. 11 Responses to "Skillet Green Bean Casserole"
Time has really flown by ever since I had children. I wish it would slow down! 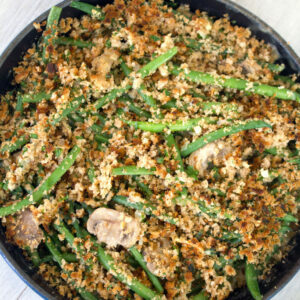 Love this casserole – yours looks AMAZING! I have no doubt that this green bean casserole is what dreams are made! All of that crunchy bread crumb topping – swoon. That’s a dream casserole! The crunchy crust looks so darn good! It’s funny, because I started to write a post recently about how time goes by so quickly the older we get – it needs to slow down! :/ This sounds so yummy… and that topping! Cannot believe Thanksgiving is next week either! 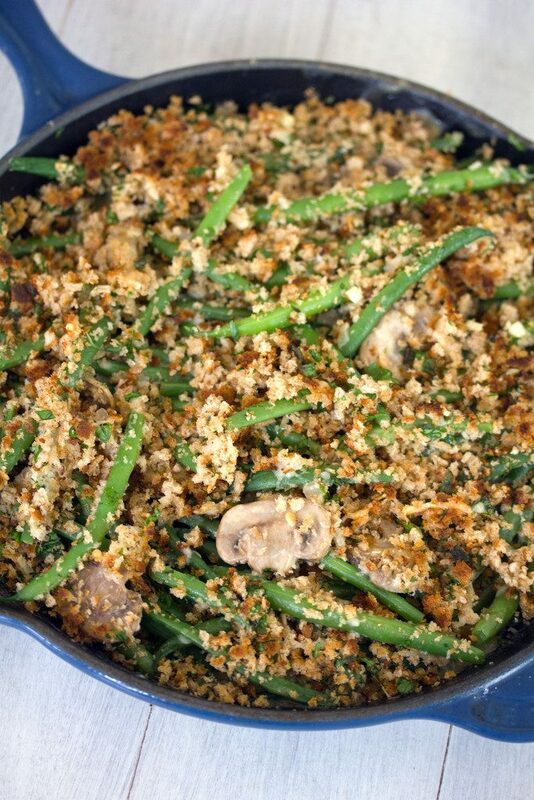 Love that you’ve made green bean casserole in a skillet, so creative!! Happy Thanksgiving! I love these one pot meals. they are delicious plus carefree! This looks absolutely delicious! I kinda want a giant bowl of this to snack on right now (yes, it’s 10:30 am and I want to snack on green beans) 😉 Have a great Thanksgiving! I am right there with you. WHY is it already nearing the end of November? And I have actually never eaten green bean casserole! We just never had it as part of our Thanksgiving routine, but I am all about this skillet version. LOVE LOVE LOVE the homemade touch! 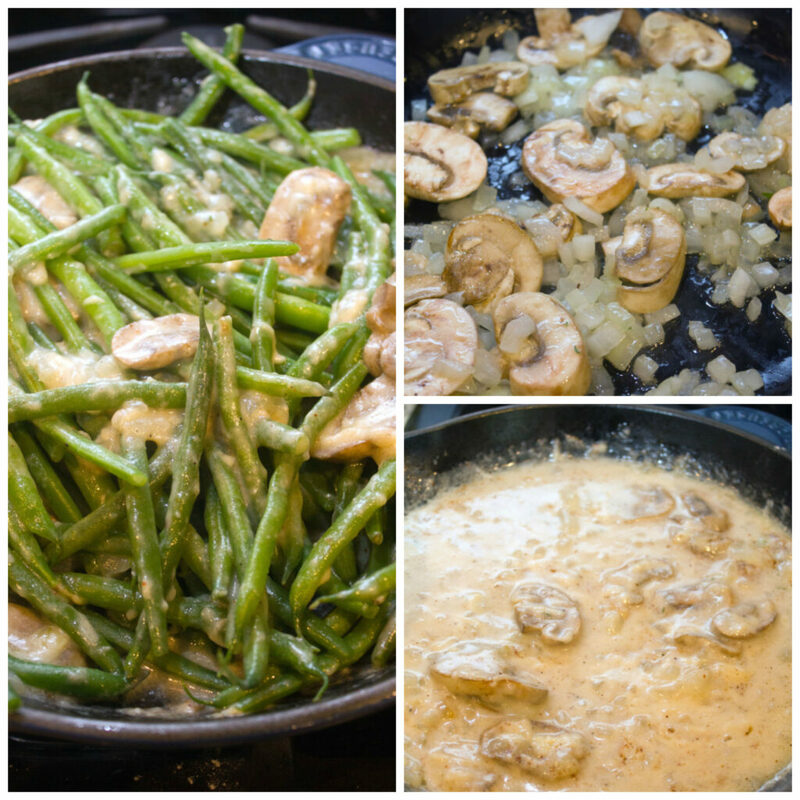 @Cindy- Green beans generally lose their color if they’re cooked for too long, so with this recipe they should stay nice and green! They’re only cooked for 3 minutes, but make sure you also follow the ice bath instruction as that will stop them from cooking more when they’re off the heat. I hope you enjoy them! !